Noise canceling curtains are an incredibly effective and affordable way to block out noise from the outside. Do you live in a busy metropolitan area? It can be extremely loud, even at night. Noise from nearby bars and restaurants, trucks driving by and pedestrians can be unbearable to some (Source). It can be impossible to fall asleep, focus on work or even enjoy oneself with so much noise coming from the outside. That’s the reason why noise canceling curtains are such an appealing purchase. But how to find the best ones? Most people do not know much about the characteristics of quality noise cancelling curtains. Read our review further to find out more. 7.1 Are Noise Canceling Curtains a Gimmick? 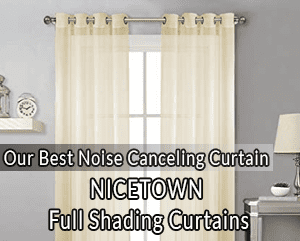 Nicetown has an incredible reputation when it comes to noise canceling curtains. The company keeps prices down by making the curtains with polyester, but still manages to get excellent shading and noise canceling performance. These sleek curtains are available in white, beige, black, brown, navy blue and taupe. They are 100 percent polyester and come in a two-pair. Each side has a width of 52 inches and a length of 95 inches. They are advertised as 100 percent blackout, which will deliver impressive blocking of any light from the outside. They are also the closest you can get to soundproof curtains on a reasonable budget. While they are a little more expensive than other options, they are well worth the extra money. These draperies are made with two layers of triple weave blackout fabric. It helps to keep out the sun, block out hot/cold air from the outside and significantly reduce noise. They are also easy to clean, as they can be put into the machine. However, they should be ironed instead of put in the dryer. Very impressive noise canceling performance. Multi-layer curtains with significant weight and thickness. Come in different color options, making them suitable for rooms of any style. Will get stained or ripped over time. Made of faux linen blackout fabric, these H.Versailtex curtains are sold as a single panel. You get a panel that is 52 inches by 108 inches, which is enough for very small windows. 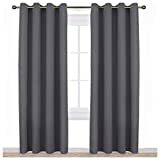 Those who have regular to large sized windows will need to buy an extra set of curtains, bringing the price to the same level as the Newtown curtains mentioned above. The good news is that you get excellent noise and light blocking from these curtains. They featured a textured and layered fabric, along with an inner woven construction. The result? Thick and sturdy curtains that will ensure most outside noise is no longer heard! These curtains can be put through the washing machine, while they can also be tumble dried on a low setting. It means they are one of the easiest curtains to maintain on the list. The only knock against the curtains is the weight, as a two-pair would be a full pound lighter than the best model in the category. Heavier curtains do a better job of blocking out low frequency sounds, which means these curtains may not be the best protection against construction noise! Faux linen fabric is very elegant and classy. Comes in thirteen different color options. Offer light blocking, energy efficiency and noise reduction. Easy to maintain with machine wash and dryer compatibility. May not be heavy enough to block out construction noise. 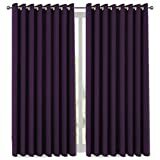 Another offering from Nicetown, these blackout curtain panels are ideal for bedrooms and similarly sized rooms in the house. They are a very affordable alternative to the above two offerings, while still providing great blackout and noise reduction. They come in 17 different colors, which makes them ideal for any type of home style. They are made of polyester and have a silver grommet design, making them very easy to install. 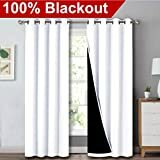 The manufacturer advertises the curtains as offering 85 percent to 99 percent light blocking, along with full soundproofing. Some noise will always be audible, even with these curtains. But they do an impressive job of completely blocking sounds such as people talking, dogs barking and cars passing by. Affordable curtains that offer soundproofing and 85 to 99 percent light blocking. Thermal insulation offers energy efficient qualities. Lighter colors do not do a good job of blocking out light. Another model from H.Versailtex makes it onto our top five list. It is no surprise, given the company’s prowess in this industry. These blackout curtains are a single panel, but they are long and wide enough to cover most windows. Compared to other single panels, that are usually 50 inches by 100 inches, these are 100 inches wide by 108 inches long. So a single panel will be the same width and length as two-pairs of the above three selections. Available in ten different colors, these curtains come in mostly dark shades. There is a white option, but it will not do a very good job at keeping light out. If you need both noise reduction and blackout properties, go with the black, grey, burgundy or blue options. These 100 percent polyester curtains are said to block out 99 percent of sunlight. They are made with a triple woven, thick microfiber fabric that results in a soft and durable product. Most users say the curtains will significantly reduce outside noise. Single panel is big enough to cover most windows. 99 percent sunlight blocking and extreme noise reduction. Only four pounds – too light to block construction noise. Another single panel that is big enough to cover most windows, the Deconovo Blackout Drapes are a solid option for those who want no fuss noise reduction curtains. 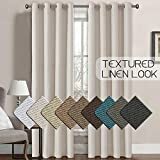 While these 100 percent polyester curtains are not as elegant or sleek as some of the above models, they do come in 23 different color options. As is usually the case, the lighter colors will do a worse job of blocking out light. These curtains are a bit thinner and lighter compared to other models, especially the offerings from Nicetown. But they are still thick enough to block out a good amount of outside noise. They are machine washable, making them easy to maintain. No fuss, noise reducing curtains. Blackout properties, especially in the darker models. Not as aesthetically pleasing. More suitable for kids bedrooms. Are Noise Canceling Curtains a Gimmick? It is amazing how many people ask whether noise canceling curtains are a gimmick. It is understandable, as it seems hard to believe that fabric could be so useful at blocking out sound. Those who are seeking a complete elimination of all outside sound may be a little disappointed. These curtains are not going to block out every bit of sound. If there is significant construction going on right outside your home, you will hear some of it. But the noise you hear is significantly quieter than it would be without the curtains. 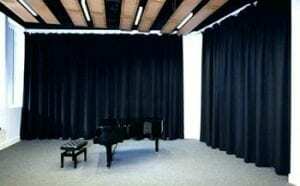 Even the echoes that can be heard in bigger houses are reduced by these curtains, as they will absorb a lot of the sound. From the outside, sounds such as construction are significantly quieter. People chatting, cars driving by and dogs barking – such sounds are blocked out or very faint. When buying regular curtains, most people seek out a perfect fit. But soundproof curtains are a little different. To get good performance out of these curtains, they should be two or three times wider than your window. They should also be roughly 10 inches longer than your window. By using curtains that are wider and longer than your window, you get complete coverage. They will do a much better job of blocking out sound, compared to noise canceling curtains that precisely fit the dimensions of your window. The ultimate performance is achieved by curtains that hang from close to the ceiling all the way down to the floor. But we know that such curtains may look unsightly, which is why we provided the size guideline above. No one likes to deal with massive, heavy curtains, especially if you are trying to set them up yourself. But it is part and parcel of buying noise canceling curtains. The heavier the curtain, the better it will block out sounds. A thinner curtain will only provide modest noise canceling properties. Heavier curtains are especially effective at eliminating or dampening low frequency sounds, such as the ones that come from heavy machinery involved in nearby construction. Homeowners who are very sensitive to any type of outside noise can even double up the curtains they have set up. It will require a heavy duty rod, but layering two heavy noise canceling curtains on top of each other will block out even more noise! Anyone who has ever installed curtains knows how important curtain rods are to the process. They are even more crucial with noise canceling curtains. The rods must be strong enough to hold these heavy duty curtains. And they can also help with the noise canceling process when they are wrap-around curtain rods. Wrap around rods are the best option for noise canceling curtains, because you attach them to the walls with a curve. It ensures there is almost no gap between the coverage of the curtain and the wall. It will cancel out noise much better than curtains that are set up with a huge air gap. Those who are thinking about doubling up curtains may need to buy heavy duty rods, or double up the rods. The final option is to go with ceiling-mount brackets. These brackets will help you get the “ceiling to floor” coverage we mentioned earlier. 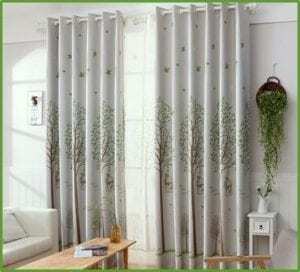 The final aspect that you must consider when buying noise canceling curtains is the material used to make them. Suede, velvet, polyester and faux linen are some of the common fabrics in quality noise canceling curtains, with polyester the most popular. The curtains should have labels describing them as insulated, thermaweave, thermalayer or something of this nature. It will indicate that extra fibers are present in the curtain with the express purpose of canceling sound. And if the curtains have added thermal properties, it is a bonus. They will help keep out hot air during the summer and cold air during the winter, resulting in lower energy costs. Some noise canceling curtains have extra layers, such as blackout liners, curtain liners or window liners. These extra layers are designed to provide another barrier that sound must travel through. Living in a big city or rowdy neighborhood should not stop anyone from enjoying peace and quiet at night. You pay good money to live at your home or apartment – you deserve a comfortable atmosphere at all times. Noise canceling curtains are an affordable and surprisingly effective way to create a quiet atmosphere in a room. Noise from the outside, such as people talking, cars passing by or construction, becomes almost inaudible. Those who are looking for the very best noise canceling curtains, irrespective of price, will love the Nicetown Full Shading Curtains for Windows. 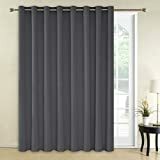 These are the best curtains on the market that will block noise from the outside, while also providing blackout from the outside light. If you want something a little more affordable, the Nicetown Blackout Curtains Panels for Bedroom are also a very good choice. They will do a commendable job at keeping noise out. We hope that you appreciated our list of the top five noise canceling curtains and buying guide. If you purchase one of these curtains, please leave a comment below with your experiences. We would love to hear from you!